Greendorphin Media’s first official podcast was recently released on our YouTube channel! Featuring Dr John Teh of PlantMed, a Brisbane, Australia-based medicinal cannabis clinic, this podcast touched heavily on the therapeutic benefits of strengthening your endocannabinoid system as well as touching on possible drug interactions. 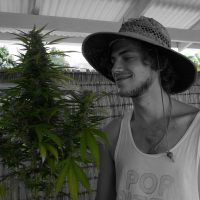 John is a friend of the Greendorphin Media family and has spoken at a number of cannabis-related events in Queensland that we’ve attended and documented. Aside from working as a surgical assistant and moonlighting tirelessly to get PlantMed off the ground, John has devoted a large chunk of the past few years to educating colleagues and other health professionals about the many therapeutic uses of natural medicines, namely cannabis and tumeric. Without further adieu, we are pleased to present to you the Greendorphin News Podcast! The immense passion that John has for his role was clear to me from thget-gogo. Like most health professionals that have stuck their neck out to campaign for the legalisation of medical cannabis in Australia. Dr. Teh cites the illness of someone close to him as one of the key factors that motivated him to pursue a role in this industry. Currently, Australian’s with a medical condition that could benefit from cannabis have to put a great deal of work into gaining access to cannabis, which then becomes a huge expense in itself. As the government softens its stance on cannabis and its derivatives, there will be room for more local production to commence which will result in less of a cost to patients. Dr. Teh reasons that most health professionals are still unaware of the therapeutic benefits the cannabis plant has to offer, as thus are less likely to prescribe the drug even at the request of the patient. That being said, it is extremely clear that re-education is a crucial next step in the fight to get patients proper medicine. One of the areas that John is especially fluent in is the way that cannabis interacts with other pharmaceuticals in the body. Dilantin and Phenytoin are both common epilepsy medications which have an inhibited function when used in association with cannabis. Similarly, there are a number of opiates and benzodiazepines that have been shown to enhance the effects of medicinal cannabis due to their reactions with enzymes in the liver. A full breakdown of cannabis its possible interactions are found in the final 20 minutes of our podcast.